Here’s a full-featured remote shutter project which [Pixel-K] just finished. It seems that he’s interested in taking time-lapse images of the cosmos. Since astrophotography happens outside at night, this presented some special design considerations. He wanted something that he could configure in the dark without zapping his night-vision too much. He also wanted it to be easily configured with a pair of gloves on. The project enclosure is a 4x AA battery box. He removed the partitions between each cell, leaving plenty of room for the guts. Inside you’ll find a lithium battery and a micro-USB recharger board. It powers the Arduino mini pro which drives the 1.8″ LCD screen and actuates the optoisolator which is responsible for triggering the camera. On the right you can see the clear knob of the clickable rotary encoder. All of the user settings are chosen and selected using just this one knob. He’s already tried it out on a 6-hour shoot and had no battery life problems or other issues. Over on Stack Exchange, there’s a proposal for a new CNC/3D printer site. It’s a personal manufacturing stack exchange, and hopefully we’ll see some awesome discussion when it’s eventually created. Stack Exchange is already well-known for hosting the most useful programming site as well as awesome sites/forums covering everything from LaTeX to grammar. The proposed Personal Manufacturing site is sure to provide a ton of advice and discussion covering the hardware, software, electronics, and toolchains of CNC routers, RepRaps and mills. The personal manufacturing stack exchange hasn’t been created yet – a few more people still need to commit to use it. Once that’s done, though, we’re sure to see a lot of very helpful advice and discussion from the Stack Exchange community. Kudos to [Michael] for sending this in. [Glen] built this shiny party machine out of a pretty sad-looking scooter. We’d bet you’re wondering why we think it’s a party machine when it looks so common? The only real giveaway in this photo is the custom exhaust, but hidden in the body of the beast is 720 Watts of party power plus a whole bunch of extras. When he gets where he’s going, [Glen] parks his ride and lifts up the seat to unfold the entertainment. 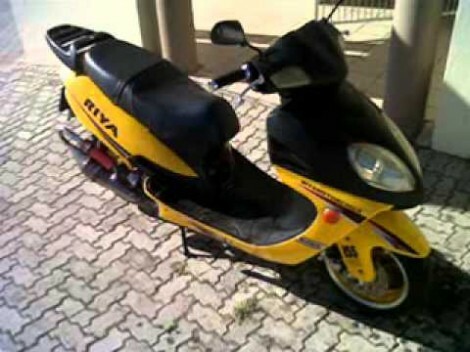 Attached to the underside of the saddle is a 720 Watt audio amplifier. It drives one big speaker under the seat, as well as two tweeters and two mid-range speakers that were fitted into the front console. But these days a party isn’t a party without some video, and that’s why you’ll also find a 7-inch LCD screen suspended from the upright seat. Tunes and videos are supplied by an iPod touch up front, or the PC he built into the ride. All it’s missing is a gaming console! The STM32 Discovery boards are nothing new, we’ve looked at them several times. But the newest sibling in the line might be just the thing to make the leap from your steadfast 8-bit projects. We got our hands on it and recorded a video review. The STM32F0-Discovery gives you a programmer and ARM Cortex-M0 chip all on one convenient board. The top portion is the ST-Link V2 programmer, and includes jumpers and a programming header which let it easily program off-board chips. The included microcontroller is an STM32F051R8T6 which includes 64kb of program memory and 8kb of RAM. Coming in at $1.80-3.77 in single units and in a hand-solderable LQFP package this raises an eyebrow for our future projects. It has an 8 MHz internal oscillator with 6x PLL which means you can run at 48 MHz without an external crystal (check out [Kenneth Finnegan’s] PLL primer if you don’t know what this is). The only thing holding us back is the development environment. ST provides everything you need if you’re on Windows, but we want a Linux friendly solution. We know other Discovery boards have worked under Linux thanks to this project. This uses the same ST-LINK V2 so it should work as well. If you want one of your own head over the ST page to see if they’re still giving away samples. There should be a button labeled “Register for your FREE KIT”. 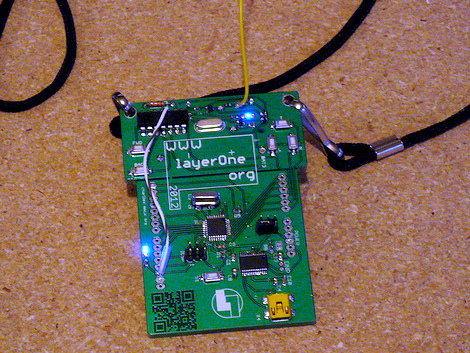 Ham skills prevail in this year’s LayerOne badge hacking contest. [Jason] was the winner with this Morse Code beacon hack.He got a head start on the competition after seeing our preview feature on the badge hardware development. It got him thinking and let him gather his tools ahead of arrival. The hardware is segregated into two parts of the board. The lower portion is a take on the Arduino, and the upper portion is a wireless transmitter meant to control some cheap RC cars. [Jason] figured this was perfect for conversion as a CW beacon (continuous wave is what Morse Code is called if you’re a ham). The first issue he encountered was getting the badge to play nicely with the Arduino IDE. It was setup to run Slowduino firmware which uses the internal oscillator. [Jason] soldered on his own crystal and reflashed the firmware. 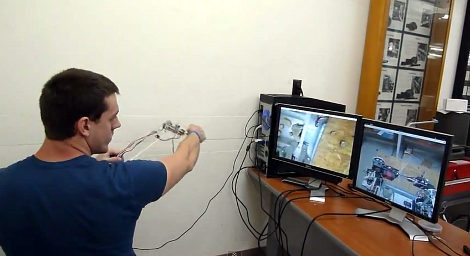 He found that the transmitter couldn’t be directly keyed because of the shifting used in the RC car protocol. He cut the power to the transmitter, and found that it could be more accurately keyed by injecting power to one of the other pins. Check out the video after the break for a better explanation of his technique. [Franklyn] wrote in to tell us about the The Hack Factory Big Board project. The Twin Cities Maker group, a Minneapolis/St Paul based hackspace, set out to provide an education tool to help students make the leap from schematic diagrams to bread board connections. Naturally their conclusion was to create a humungous 10x scale bread board. The board features scaled up yet fully functional capacitors, resistors, a dip switch, and the jumbo-est LEDs we’ve seen in a long while. Like its 0.1″ pitch counterpart, passive components can be thrown in 1″ pitch breadboard to create a myriad of analog circuits. 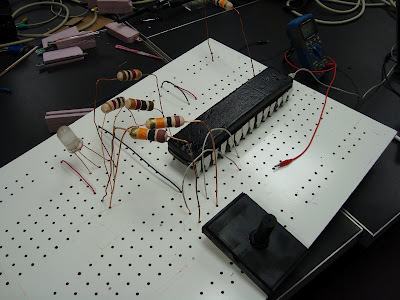 The Twin Cities folks even tossed together an optical theremin using a scaled up photoresistor. Beyond analog circuits the board can also demonstrate various ICs using either a custom breakout board featuring an 8-pin DIP socket or a vacuum formed Atmega 328 which boasts an internal Arduino Uno. The cool thing about the giant 28-pin DIP is that it does not necessarily function as a microcontroller. Instead the UNO will be loaded with chip emulation programs geared towards the lesson at hand, jumpers select programs to teach debouncing, logic, flip-flops, and a whole slew of other basic concepts. 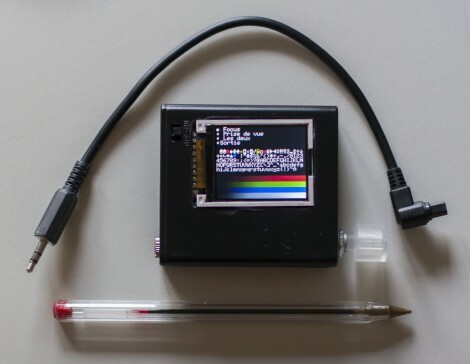 We are a bit concerned that the next logical step is a gigantic soldering iron, but at least we finally have something to interface to the huge liquid crystal display. If you still want more giant circuit stuff check out this 555 footstool. Check out a quick intro video after the jump!